It’s easy to pray with meaning in Hebrew with the new interlinear format developed by ArtScroll to give you maximum comprehension with minimum effort. How can this new format help you? You focus on the meaning of the prayer, because you see the translation as you pray As your eye sweeps over each line of print, it notes the precise English definition of every word printed just below the Hebrew. When you come to a word you do not understand, the English translation is right there — word by word, so you easily absorb the meaning and move on. The secret of this remarkable innovation is the row of arrows between the English words. This visual device keeps your eye moving right to left, right along with the Hebrew, even though you are reading in English! This system is so effective that ArtScroll is having it patented. The more you use the Interlinear editions, the more you learn to associate Hebrew and English terms, become aware of nuances of meaning, even discover grammatical patterns. The result is increased comprehension of Hebrew in every context. Whatever your level of Hebrew knowledge, you can keep up with the service and participate in meaningful prayer. 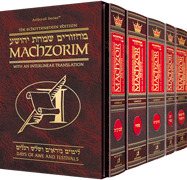 The Interlinear Series brings you ArtScroll’s tradition of excellence in translation, a masterfully written commentary, clear, concise instructions and comprehensive Laws sections.